Hanoi​ (VNA) – Chairman of Vietnam’s National UNESCO Committee Le Hoai Trung expressed his hope for strengthened cooperation with the United Nations Educational, Scientific and Cultural Organisation (UNESCO) at his talks with visiting UNESCO Director General Irina Bokova in Hanoi on August 24. They agreed that the bilateral relations have developed well and lifted to a new height after the historic visit made by former Prime Minister Nguyen Tan Dung to the UNESCO headquarters in Paris, France, in 2015. 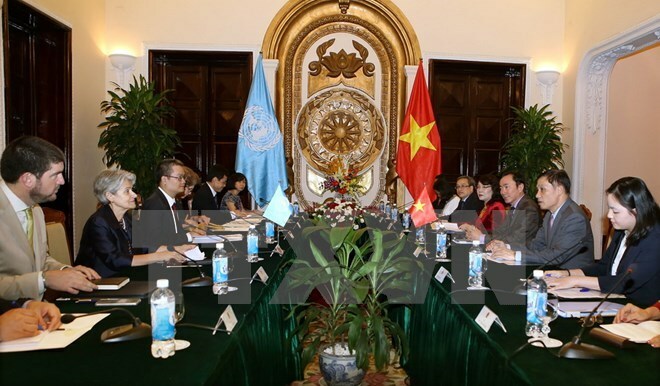 To date, both Vietnam and UNESCO have implemented many targets of their Memorandum of Understanding on cooperation effectively. At the meeting, the two sides discussed cooperation potential and priority goals in the fields of education, culture, science, information and communications. Trung, who is Deputy Minister of Foreign Affairs, emphasised the importance of UNESCO in implementing the 2030 sustainable development goals, adding that Vietnam and the organisation could share their ideas and experience to serve sustainable socio-economic development. Irina Bokova affirmed Vietnam has made important contributions to the organisation and spoke highly of the country’s role as a bridge for intensified relations between ASEAN and UNESCO. On the same day, the UNESCO Director General visited Bai Dinh pagoda in the northern province of Ninh Binh, which is located in the Trang An landscape complex – a UNESCO-recognised Cultural and Natural World Heritage site. In a meeting with provincial leaders, she appreciated the locality’s policies and efforts to preserve and promote the value of the heritage site.